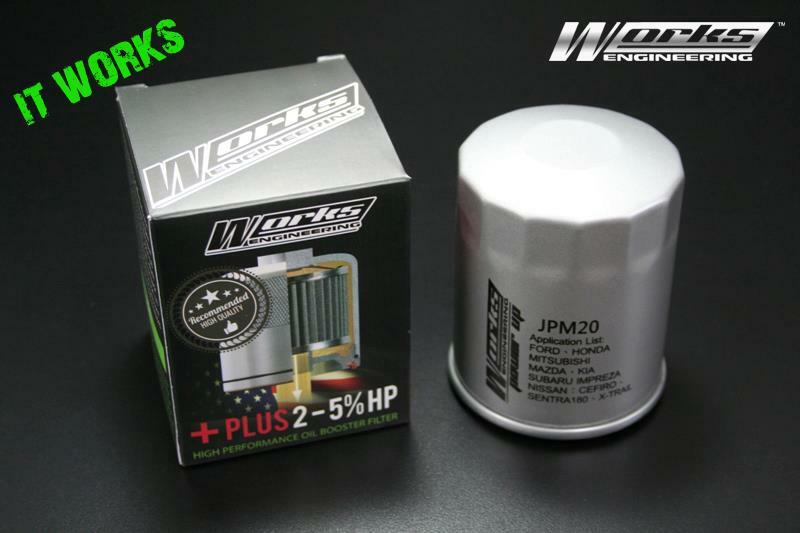 Works Oil Booster Filter can effectively raise 2-5% horsepower and also increase engine oil pressure by at least 0.4kg/cm. Oil Booster works on the principle of adding 8 special baffles inside the oil filter core, which increases flow rate of the filtered oil back into the engine by Eddy Conduction. Increased volumetric oil flow and pressure lubricates more effective and increase horse power. Each product undergoes extensive testing to measure flow and maximize gains, which are represented in the performance charts that highlight the benefits of Works Models over stock models. As demonstrated by these performance charts, this Works Oil Filter offers improved filtration and decreased flow restriction compared with stock filters.